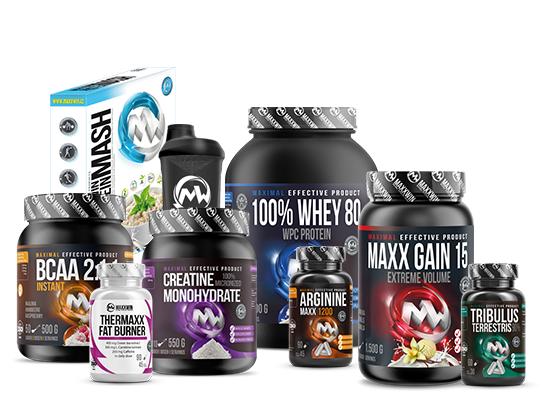 Complete overview of products, intended for increasing endurance and physical ability. Advantageous package designed for higher stamina and physical endurance. Contains the necessary supplements and the usage plan! Amino acids BCAA in high anabolic ratio 4:1:1 suppors muscle growth and regeneration. Prevent the loss of muscle mass. In great tasting instant form. BETA ALANIN 1000 decreases negative effects of milk acid and fast exhaustion of the body parts. You will be able to train much longer! After-workout coctail containing all necessary nutrients for growth of muscle mass, proper regeneration and protection of joints! Amino acids BCAA and L-Glutamine in one! Supports muscle growth and regeneration. Prevent the loss of muscle mass. In great tasting instant form. Professional amino acids BCAA, in high anabolic ratio 4:1:1. Advantageous package 400 capsules. Amino acids BCAA supporting muscle growth and regeneration. Prevent the loss of muscle mass. In great tasting instant form. Gainer for rapid increase in muscle mass and strength. Protects muscle mass and improves performance. A unique complex of highly effective natural extracts and agents for fat burning, suitable especially for men. Experience training on maximum! Pre-workout booster with the most effective ingredients. Excellent taste and solubility. Without sugar and creatin!